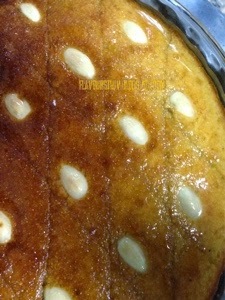 Basbousa is a delicious dessert, a sweet cake made with semolina flour, coconut and lemon flavored sugar syrup. Traditionally, it was cut in diamond shapes and decorated with almonds. The cake itself is not too sweet but it is soaked with sugar syrup. It is very easy to prepare and the best thing I like about it is that we can make it ahead and serve it as a no-fuss dessert. We can prepare the batter a day before and bake it just before the guest arrive. 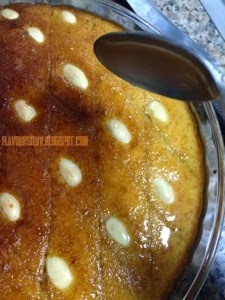 Basbousa is a pretty famous dessert recipe in the Middle East and Egypt. 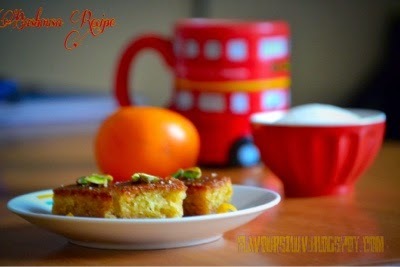 In Turkish this dessert is known as Revani. Prepare syrup first. Dissolve sugar in water in a medium saucepan. Bring to a boil and add lemon juice. Reduce heat and allow to boil for 5 minutes. Remove from heat and set aside. 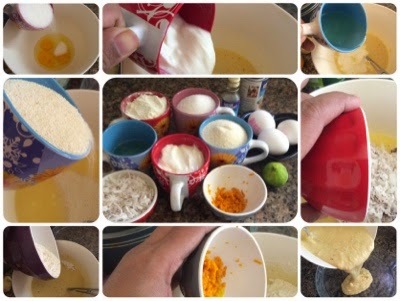 In a mixing bowl add eggs and sugar and mix well. Add yogurt and oil to this and mix to combine. Swift flour with baking powder and add to the mixture. Combine all other ingredients ( semolina, grated coconut, vanilla essence and orange zest ) to this. Pour mixture into the baking dish and smooth with a spoon. Refrigerate for 1-2 hours ( optional ). Boil some water in a pan, soak almonds in it. Transfer into cold water and slip off the skin. Take a butter knife and make diagonal lines, place an almond in the center of each diamond. Bake for 25 minutes. Remove cake from oven and cut through the lines. Pour the syrup over cake until no more can be absorbed. Thank you for stopping by my space....keep in touch. Thank u for visiting my blog ...u too have a nice space ...happy blogging.